Allah said, “Verily when He intends a thing, His Command is: ‘Be!’ and it is!” (YA-SIN, 82). The moment Allah wills a thing it becomes His Word or Command and the thing forthwith comes into existence. 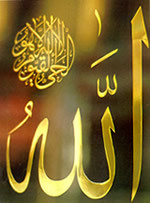 There are two differentways of reading this Quranic verse which give two relatively differentmeanings; the first makes the reader understand that the thing Allahwills to exist comes into existence after the Command is given, whereas,the second makes the reader understand that the thing comes into existencethe moment Allah wills it to exist; thereupon, His Command (Be! )does not precede nor succeed the existence of that thing. For instance,people’s resurrection from their graves does not precede nor succeed Allah’sCall, He said, “Then when He calls you, by a single call, from theearth, behold, ye straightway come forth” (RUM, 25). (1) It is the information revealed to us by Allah aboutthe Perfection of His Power over His existing creatures and the fulfillment of His Will, as His Command to the Children of Israel to be apes despised and rejected and they became as He wished them to be, and in this case the command (Be!) is not to a thing that does not exist. (2) Allah is the All-Knowing of everything that exists even before its existence, and of everything that happens even before it happens. All existing things, even before their real existence, had been existing in the Omniscience of Allah in the form He had predetermined for them; then He commanded them to exist so they existed and emerged out of non-existence to existence, from the realm of the unseen to the realmof the seen, as everything had been shaped since eternity in His all-inclusive Knowledge. (3) This is an all-inclusive revelation given to us by Allah and includes everything that is created by Him; if it pleases Him the thing will be created even without a word is said by Him; it is the will ofAllahexpressed in terms of the Divine word (Be!) torepresent His Perfect Power and its effect on what He wills, so that theDivine Will is fulfilled without denial, cessation, or even the need toan instrument. First, the word of Allah is eternal, ancient, and not created; if the Divine word (Be!) had been created then it would have needed a second word which would also have needed a third word and so on. This is logically impossible. Second, Allah, Praise and Glory be to Him, wants everything that happens to happen, the good and the evil, the useful and the harmful; because the one who sees in his kingdom something that he hates and does not want, this will either be because he is ignorant and does not know, or he is powerless and cannot tolerate, and these matters can never be attributed to Allah Who is the All-Knowing, the Omnipotent eternally. Third, Allah still commands the known; He is the All-Knowing, the All-Powerful, despite the delayed existence of things. All powerattributed to Allah is ancient, and the purport of the DivineCommand (Be) is ancient; it derives its existence from the existence ofthe Exalted Self, Praise and Glory be to Him, He is Allah.